Beautiful condition Coronado "Racetrack" portable from 1947. Coronado was a house brand set sold by Gamble-Skogmo department stores headquartered in St. Louis Park, MN. Gamble-Skogmo contracted with several other radio manufacturers such as Belmont and Wells-Gardner to furnish radios bearing their name. The radio is working fine and playing clearly, receiving all my AM stations. 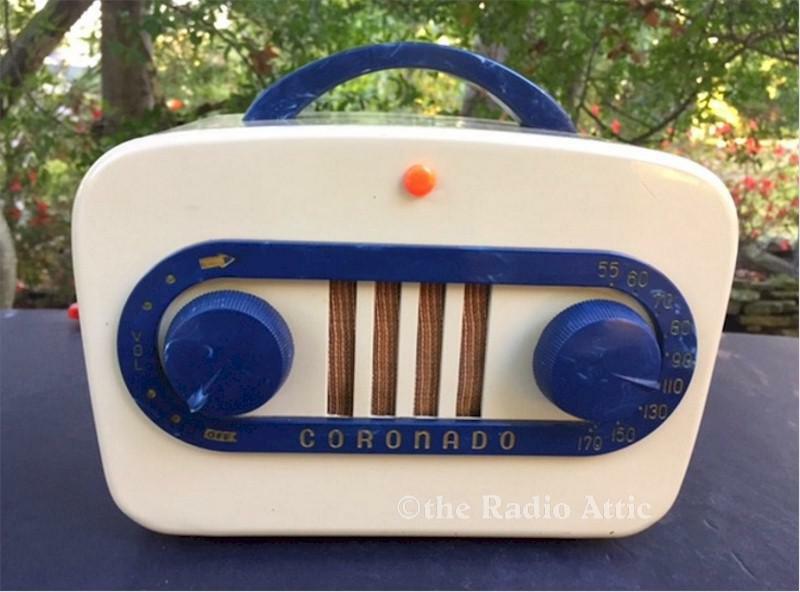 This is a highly collectable radio with a painted Bakelite case and blue Polystyrene knobs, racetrack dial and handle. The trim is often mistaken for Catalin. This case has no damage, and practically no paint chips at all. There is an orange button in the center which lights up when the radio is on. It has most of its label on the bottom, and also has its original back, usually always missing. Small at 9"W x 7-1/2"H x 5-1/2"D.